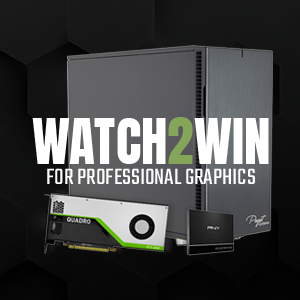 The new WATCH2WIN offers many opportunities to get entries for the Grand Prize, an NVIDIA Quadro RTX 4000 Powered Workstation from Puget Systems. This workstation is ideal for everything from Media Editing, CAD, Virtual Reality, or anything in-between. There are 13 ways you can earn from one to three entries for the grand prize. The most entries are achieved by watching our short and informative videos, which highlight the key benefits and advantages of using NVIDIA Quadro GPUs in professional workflows for target markets such as Manufacturing, Media and Entertainment and AEC. Additional entries are earned through sharing PNY’s engaging videos with accounts or colleagues who are interested in using professional graphics solutions to accelerate their workflows. As an incentive to stay up to date with Quadro product information, tips and tricks and use cases, you can also earn entries by signing up to PNY's Quadro-centric professional social platforms. We hope you enjoy this new and exciting way to learn more about Quadro products and solutions. Check the WATCH2WIN page regularly, since we will be adding additional videos as they become available.